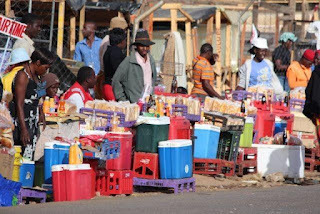 Harare City Council and the national police yesterday launched raids against vendors in the central business district after pleas for the informal traders to leave the streets due to a cholera outbreak fell on deaf ears. The raids, which began late in the afternoon, saw the vendors and the police being engaged in cat-and-mouse games as the local authority moved to decongest the city centre. A number of traders abandoned their makeshift stalls as they fled from the police. After the raids, streets were littered with all forms of rubbish ranging from vegetables to cardboard box material. There was a rare easy flow of traffic on some roads that had become impassable due to vendors. The majority of the vendors said they were not happy about the raids. “This is so unfair, how do they expect us poor people to survive? We do not deserve this abuse,” said a vendor who asked to remain anonymous. “We voted for them and they have failed to secure jobs for us. Taxis and commuter omnibuses that were operating at undesignated areas were also being removed. The raid came after council and National Vendors’ Union of Zimbabwe leader Sten Zvorwadza gave the vendors a 24-hour ultimatum to leave undesignated vending sites to curb new cholera infections. Harare is the epicentre of the latest cholera outbreak that has claimed 28 lives countrywide and affected over 4 000. President Emmerson Mnangagwa last week declared the epidemic a state of national disaster. Cholera and typhoid outbreaks have become a common occurrence in Harare due to infrastructure decay and water shortages.